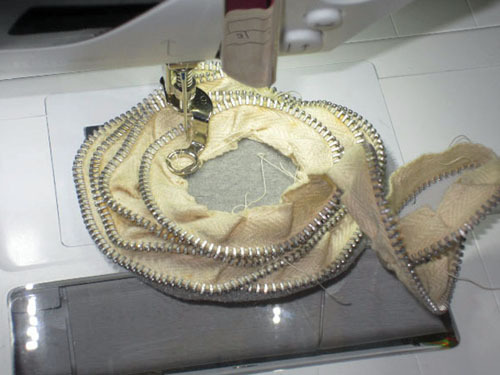 How to Make Jo’s Zipper Tape Rose on Your Sewing Machine – NO Handwork! 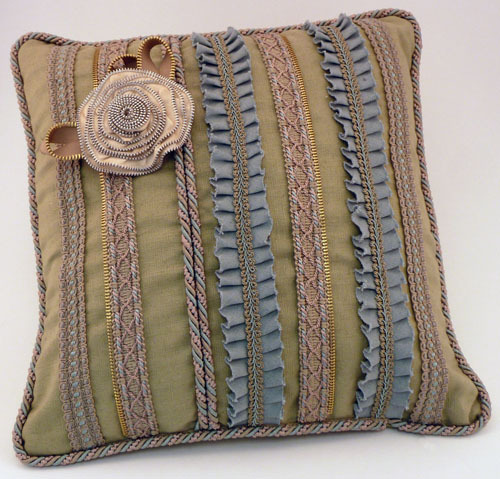 Two weeks ago I showed you my Made to Create pillow and all the accessories I used to create the trims and stitch it together. 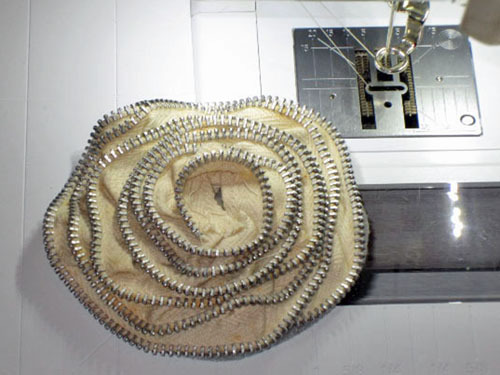 And I promised to show you how I made the zipper-tape rose – which I made entirely by machine – no hand sewing! First, a little background. I didn’t come up with this idea entirely on my own. Last Christmas I made ornaments and brooches using two patterns from Indygo Junction – Zipper Christmas Cheer and My Christmas Zips, plus two packs of Zipper Accents – one in Holiday and one in Classic. Robin Mackintosh’s instructions are great, and I spent a couple relaxing evenings hand-sewing these while watching holiday movies. But – being a sewing machine kind of person – I thought to myself, “Hmm. 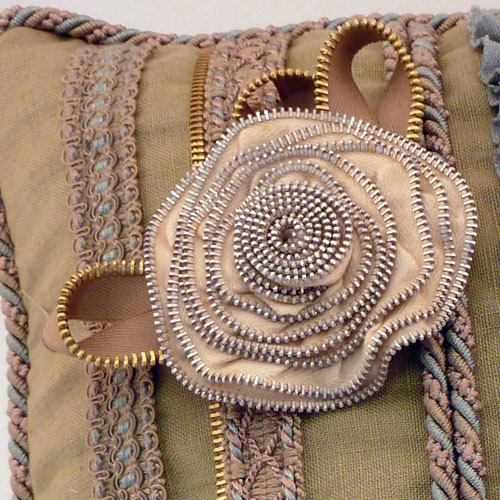 There must be a way to do this by machine.” Around that time I got my Make to Create Pillow assignment, and this pretty machine-stitched zipper-tape flower came about. Follow the steps below to make one – or more – of your own. Step 1) Gather the supplies. For this flower I went into my zipper stash and pulled out some long off-white upholstery zippers for the rose petals, and some heavy-duty beige zippers for the leaves. I also cut two circles of felt for the flower base. You’ll also need some fabric glue or a glue gun. Step 2) Gather or pleat the zipper tape. But how? Ruffler #86 to the rescue! The little pleater device is sturdy enough to put pleats into even heavy twill tape. 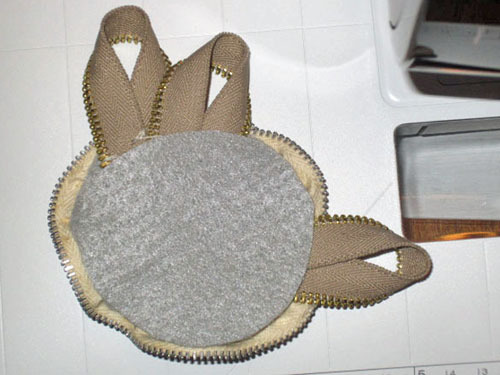 Step 3) Attach the pleated zipper to the felt base. Now, I’ll warn you – this isn’t very pretty on the back during this step. But we’re only concerned with how it looks when it’s done, right? Right! Put a small free-motion foot of your machine – I used Darning Foot #9 – and select a bartack stitch. 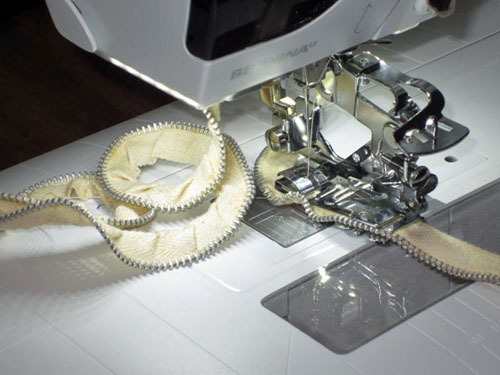 Beginning at the outer edge of one felt circle, tack the zipper tape in place as you swirl it around in ever-decreasing circles, securing it every 1/2″ to 3/4″. Don’t try to make this even; it’ll look best if the placement is more-or-less random. Just be sure to cover the edge of the previous zipper tape as you go along. 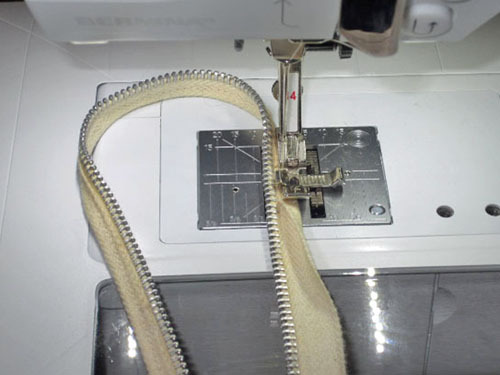 Tip: If you don’t have a bartack stitch, select a zigzag stitch about 2.5 mm wide, lower the feed dog (or turn the length to 0 mm), and stitch in place 4-5 times. Continue until there is just a small area left in the middle; we’ll fill this in later. Step 4) Add the leaves. Step 5) Make the inner flower petals. Step 6) Attach the inner petals. We’re done with the sewing machine, ready for the glue. 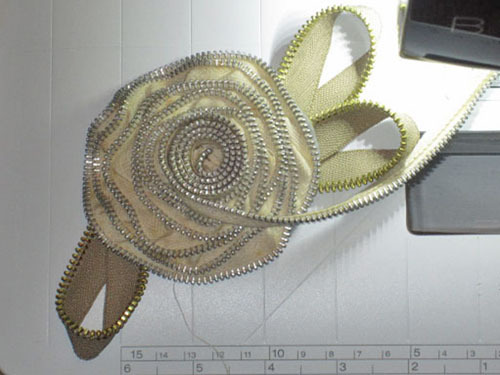 Start rolling the prepared zipper; when it’s about 3/4″ in diameter glue it to the center of the flower. Continue rolling the zipper around the center, gluing it in place, until you like how it looks. 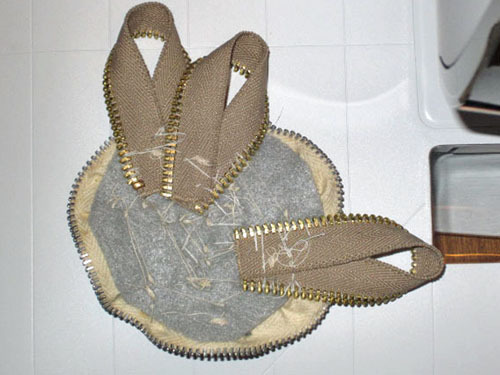 Clip the zipper (use pliers or wire cutters to snip between the teeth), tuck the end underneath, and glue it in place. Step 7) Finish the back. Here’s where the second circle come into play. Glue it to the back of the rose, over the first circle and all those messy tacking stitches. Looks better, huh? Attach a pin-back if desired, or simply tack it in place as I did. Done!